Baked chips are a great appetizer and a healthier alternative to store bought chips. A plantain looks like a banana, but has more of a potato taste and consistency so it lends itself well to make chips with them. When baking these, the bottom will brown more than the top, as shown below. They are used quite frequently in “South American” type of dishes and served with various salsas. I paired this one with a creamier dip or you can try pairing it with Pico de Gallo or Mango Avocado Salsa. If you like these try Beet Chips and Dip and Parsnip Chips and Dip. Peel plantains. Thinly slice both plantains on a slight diagonal. Place onto a cookie sheet spayed with non-stick spray. Once all plantains slices are spread onto cookie sheet spray each slice with non-stick cooking spray. Lightly sprinkle with kosher salt. Bake in preheated oven at 375 degrees for 18-20 minutes. Cooking time will depend on thickness of plantain slices. While plantains are cooking, combine goat cheese and skim milk in small container. Mix and place into a ramekin. 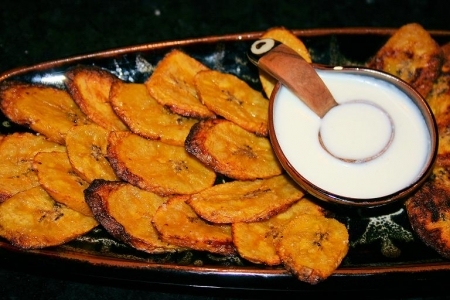 Once plantains begin to brown, remove from oven. Transfer to serving dish with dip and serve.